The elderflowers are flowering like crazy at the moment, so it is time to make elderflower champagne! It is really easy to make, and tastes delicious! Also there was plenty of rhubarb in the garden so made a batch of rhubarb champagne at the same time. It looks so lovely and pink, can’t wait to try it! 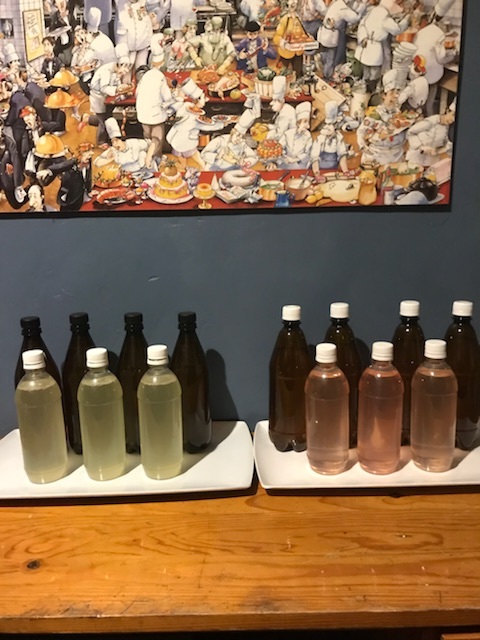 Every day we have to release a little bit of air from the bottles until the fermentation slows down, then the lids get tightened and it is nearly ready-yum! This entry was posted in General, Preserving, Produce by Peasants. Bookmark the permalink.